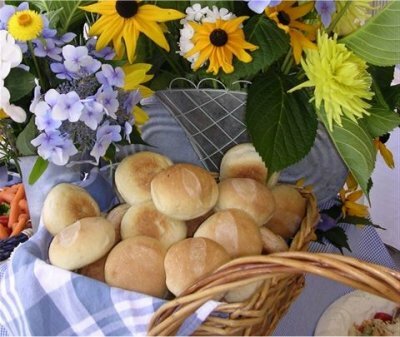 Tallahassee area catering solutions for Octoberfest Celebrations. Whether you spell it Octoberfest or Oktoberfest, this German-Bavarian celebration is fun, fun, fun! We love catering Octoberfest parties! For inspiration, head north to the mountains of North Georgia. Every fall the village of Helen, pulls out all the stops for their annual Oktoberfest celebration. Throwing an Oktoberfest party? Need help with the menu and cooking the food? We'll help! Canopy Rose serves the following communities: Tallahassee, Thomasville Georgia, Cairo Ga, Bainbridge, Havana, Quincy, Monticello, Madison, St. George Island and all communities within about a 125 mile radius of Tallahassee, Florida. 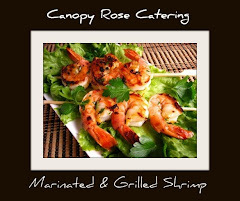 When it comes to innovative Tallahassee Florida area catering food stations, for catered events, weddings and holiday parties thoughout the Big Bend Region, Canopy Rose is second to none! Several ideas for fabulous food stations can be found online at the caterer's website, but an even greater collection of ideas is under the lock and key of chef/owner Kathi Dameron's prolifically creative mind. We love to custom-create food stations for Tallahassee area catering events that are one-of-a-kind originals for our catering clients and their invited guests. There is really no reason to have a cookie-cutter event! Today we are showcasing our Canopy Rose Brownie Martini Station. Mmmmm! This is so yummy. This station juxtaposes our double fudge brownies, hand-churned ice cream, spirited splashes and tantalizing toppers in a fun-spirited, yet sophisticated style. It's pure Canopy Rose! 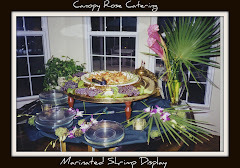 Canopy Rose is a favorite Tallahassee Florida area catering business. In the fabulous, whimsical and festive book, Essentially Lilly ~ A Guide To Colorful Entertaining, Author and Designer Lilly Pulitzer of Palm Beach Florida shares a pro's proven tips and strategies for organizing a charity benefit. Lilly writes, "one of the biggest steps in planning (a benefit) is making sure people come to the event." Lilly suggests that planners should "build enthusiam for the charity by hosting a high tea and have a speaker make a presentation to familiarize your committee with the history and needs of your chosen charity." For more great food ideas for a ladies luncheon, high tea, fashion show or fundraising fete visit Florida Caterer. 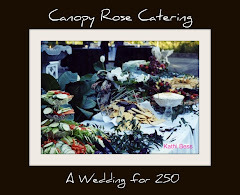 Canopy Rose Catering, the wildly popular North Florida and South Georgia catering company is available for all manner of catered charitable galas. We can be reached at 850-539-7750. Vichyssoise, Gazpacho, New England Clam Chowder, Shrimp Bisque, Corn and Sausage Chowder and Thai Coconut Chicken Soup are just a few of the hundreds of beautifully brewed soup recipes in our private Canopy Rose Soup and Chowder Collection. For your next catered event, why not let us set up a Canopy Rose Soup & Chowder Station for you? Guests love a cup of soup! Perhaps one of the reasons Soup Bars are so popular at soirees, is because they are quite unexpected! Our delicious, flavor-popping soups are hand-crafted for each order with the freshest and purest ingredients. For more info contact us at 850-539-7750. Tallahassee Florida Catering. L' ete c'est fini, "summer is over" triggers delicious inspiration for a late September soiree. For French foods I've turned to the wonderful book, French Women For All Seasons ~ A Year of Secrets, Recipes & Pleasures by bestselling author, Mireille Guiliano. Potato Gratin A La Normande, Potato Olive Ragout, Farfalle with Edamame, Mussels in White Wine and Buttersquash Soup are just a few of the recipes that I want to experiment with during the glorious days of autumn. tallahassee florida caterer Need help with a North Florida or South Georgia French-themed party call 850-539-7750. Lady Bird Johnson once said, " You should work on projects that make your heart sing." Having spent much of her childhood "roaming woods where dogwoods bloomed like lace and wild roses grew along the fences" she wanted children everywhere to know and remember nature the way that she did. On her seventieth birthday in 1982 she founded the National Wildflower Research Center in Austin, Texas. Wildflowers are a beautiful theme for special celebrations! Vibrant and bursting with color, wildflowers are a splendid launching pad for creative color combinations, unique theme interpretations and exquisite food. Working on fabulous catering and special event projects is my life work...this is truly the project that makes my heart sing! Unexpected company coming to Tallahassee? Spouse wants to invite the boss over for dinner this weekend? In-Laws coming in from out of town for the holidays? Need to throw a dinner party, Sunday brunch or cocktail party? Need to order a working lunch for the office? Need to send a dinner to a friend just home from the hospital? Need to find a caterer for your company Christmas party? Need to find a legislative catering company for an event for 2500 guests at the Florida Capitol Courtyard? Need to find a wedding caterer that will cater at the beach? Need to find a food service provider for breakfast, lunch and dinner for 2 months? Need to find a special event designer for your organization's annual fundraising gala? Need to find a place to purchase home meal replacements for your elderly parents? Looking for a great cooking class to attend today in the Tallahassee area? Tonight, September 18, 2008 from about 7:00 pm to 8:30 pm, Tallahassee Herbalist Wendy Creel will be teaching a class at the Canopy Rose Culinary Arts Studio and Catering Company in historic downtown Havana Florida. Canopy Rose is located in the old Havana Bank building. We are on the corner of Hwy 27 and 7th Avenue. Our building has a green marble facade on the front and is painted white brick on the side. You can't miss us! Just look for the Canopy Rose signs. We are across the street from H&H Antiques. The title of Wendy's class is "Juicing for Longevity" ... sounds like a great class! Last night The Kitchen Goddess, Jill Welch dazzled her students with a class here on "Natural Ferments." Both classes offer delicious solutions to optimizing your health and vitality! For more great health-related cooking classes, check out New Leaf Market in Tallahassee. We are pleased to have New Leaf Market sponsor Jill and Wendy's Havana cooking classes in our culinary arts studio! Wondering about other cooking classes at Canopy Rose? We offer private cooking class parties. Simply pick your menu from the menu offerings at http://www.canopyrose.com/, verify the date with us to make sure we can accommodate your request, and then start planning your guest list! Private cooking class parties are great for wedding showers! Questions? We can be reached at 850-539-7750. 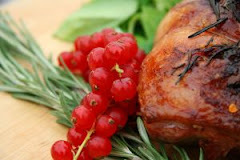 The September Recipe of The Month has been added to the Canopy Rose Catering website. Each month we post a new monthly recipe for our visitor's enjoyment. This month we posted an old favorite recipe from Kathi Dameron's Recipe Archives. It's easy! It's fun! And it's a true crowd pleaser. I'm not going to tell you what it is, though. You'll have to go on your own treasure hunt through the website to find it! The first person to find it and email me what it is .... receives a special food treat from Canopy Rose! Let the race begin! The contest ends at midnight on September 19, 2008. Miss this month's chance to win a Canopy Rose Treat? Not to worry because we will be running other fun contests in the very near future! And of course, you can always order any of our food! Food gift prizes available only to North Florida or South Georgia residents who can pick up their prize at our Culinary Arts Studio in historic downtown Havana. Slow roasted pot roast like mom use to make... mmmm! We make our version the old fashioned way with peeled and chopped potatoes, carrots, onions, tomatoes, fresh minced garlic, a secret mix of seasonings, a splash of wine, some rich and savory beef stock and lots & lots of delicious beef. During the months from September to March, we find that our catering customers love this stick-to-your-ribs fare for catered office luncheons, dinner parties, corporate annual holiday events, and with our savvy clients who simply want to stock their freezer with small portions of the delicious foods of Canopy Rose. Legislators who come to Tallahassee during the working week for the annual spring legislative session call on Canopy Rose to help them stock their freezer with delicious home cooked meals, custom packaged in individual portions and ready to be nuked on a moments notice. We all know that we can dine on just so much rich and fancy food, until we crave the more homespun, the more down-home foods, those comfort foods that remind us of Sunday Dinners around the dining room table, when loved ones gathered together after church for recreation and refreshment. The comfort foods collection from Canopy Rose Catering, the popular Florida capital region caterer will delight your tastebuds with nostalgic flavors and soul-satisfying goodness. There will be two different cooking classes in downtown Havana, Florida at Canopy Rose Culinary Arts Studio and Catering Company during the week of September 15, 2008. 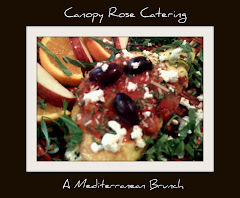 Would you like to be on the Canopy Rose Cooking Class Mailing List? Please send your contact information to canopyrose@aol.com. The tropical island theme that conjures up the mood of the lovely islands of the South Pacific is the inspiration for this soiree offered by Canopy Rose Catering. Treating the staff to a traditional (or not so traditional) Thanksgiving or Christmas Feast is a very good thing to do! 1. Decide on the location where the event will be held. Do you want to have it at your office or would you prefer to go to a private home, restaurant or banquet room? We are happy to deliver and set-up our food at your location or we can suggest some favorite locations to you for consideration. We have several menu options to choose from that cover a wide range of budgets. For those on tight budgets, we offer some nice packages that start as low as $10.00 per person. For more generous budgets we offer a delicious cornucopia of menu options. 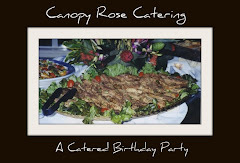 Our website at www.canopyrose.com lists food, prices, packages and much more to help you in planning your holiday function. 3. Lock down your vendors. Most caterers and event facilities require a minimum deposit. The deposit will lock down the services that you will need for your special event. Need help with all of this and more? Call Kathi Dameron at 850-539-7750 and we will handle all of the details for you! We've been planning parties professionally for 14 years and as a passion- for a lifetime! Imagine... your grand daughter has just become engaged to a fine young man that she met while attending Florida State University. The families of both the bride and the groom live across the country and since the couple has made Tallahassee their home for several years, they wish to be married in their community. Being recent college graduates, money is tight but their hopes and dreams for a beautiful life together are big, and their list of best friends is long. In fact, they are looking at a wedding guest list of over 350 people with a rather small allocated budget from her mom and dad, who are already stretched financially with 2 mortgages and the college tuition of 2 other children! The allocated budget barely covers the banquet room rental. What will the couple do? Scenarios like this are not uncommon, especially with the ever-rising cost of a 2008 or 2009 American Wedding Reception. 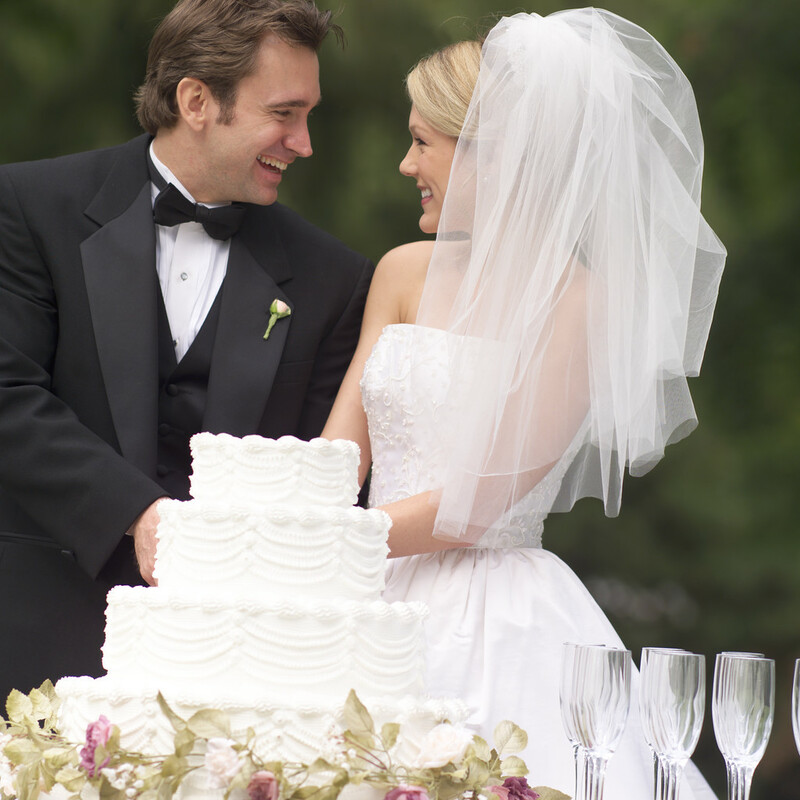 It is anticipated that the average cost of US Weddings will top $30,000. 00 within the next few years. OUCH! Perhaps it is time for a new wedding paradigm! At one Florida based catering business, Canopy Rose Culinary Arts Studio and Catering Company, owner Kathi Dameron is promoting the gift of multi-generational funding to help offset the high costs of getting married today. Ms. Dameron sees multi-generational funding as a tasteful way for grandparents, parents and other family members to contribute to the overall or specific cost of a special celebration through the gracious gift of a Canopy Rose Gift Certificate. This beautiful idea can be used for any of the Canopy Rose food and catering services needed for engagement parties, wedding showers, rehearsal dinners, wedding receptions, gourmet wedding night picnic baskets for the bride and groom, pre and post wedding brunches and even the hotel room hospitality baskets and food platters for out-of-town guests. Are we seeing the emergence of a beautiful and delicious new trend? Perhaps its more like "Something Old...Something New..."
For in the days of long ago family members often played active roles in helping to put on a wedding feast. But in today's fast paced, mobile world where families often live hundreds if not thousands of miles away from one another... its great to know that wedding menus can be reviewed and coordinated online. The Canopy Rose website at www.canopyrose.com offers menus, price lists, packages and tons of useful information for anyone trying to plan a wedding from their computer. For more information on how we might be able to assist you in planning and funding your wedding reception contact the Canopy Rose offices at 850-539-7750. 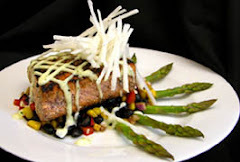 Give the gift of fabulous food from Canopy Rose Culinary Arts Studio and Catering Company! Gift Certificates are available for $50, $100, $500, $1000, $5000 and $10,000. Are you researching a place to hold your annual employee company party? Are you looking for something a little different this year? Are you looking for a rental facility that won't eat up your entire Christmas Party Budget? Are you looking for a one-shop solution? We have an arrangement with one of our region's most interesting venues to bring in the delicious catered foods of Canopy Rose. In fact, we will work with you every step of the way to create a memorable and delicious event for your group. Or if you prefer, you can turn over all the planning responsibilities to us and we will attend to the myriad of party planning details for you. This beautiful sit-down or buffet dinner location is located in a historic venue seven miles from Tallahassee. The unique setting will seat up to 250 people for a seated dinner. The facility has chairs for 150 guests. Additional chairs can be rented from a rental company. 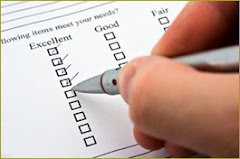 We will be happy to assist clients with determining rental needs. Catering Available Through Canopy Rose Culinary Arts Studio and Catering Company. As of today (9 /12/08) we have some dates already booked and anticipate to completely book the facility during the month of December. Please call today if you are interested in learning more about this great party site! Canopy Rose Culinary Arts Studio and Catering Company is pleased to announce the addition of three Traditional Holiday Dinner / Luncheon Packages for the North Florida and South Georgia market. Our corporate clients have already started requesting menus for their December company parties and as usual for this geographic region there are many office managers, bosses and staff that want to see the "Traditional Christmas Dinner" brought in for their annual celebration. Canopy Rose does an excellent traditional holiday meal, that is truly second to none! Our packages are designed to work for each unique situation. While some offices just want the turkey, ham and dressing to be provided by an outside source, other offices want a full catered function with a nice blend of traditional fare mixed with some special culinary treats that they won't generally find on the typical holiday buffet. The Canopy Rose Custom-Designed Traditional & Non-Traditional Packages For more great holiday dinner or luncheon selections please browse the main menu. Why Not Host A Canopy Rose Clam Bake For Your Next Special Event? When you are looking for a party solution that will long be remembered by your guests, you can't miss with this fabulous Canopy Rose Clam Bake! Whether your event is at the beach or inland, Kathi Dameron and the Canopy Rose team will wow your guests! For more great entertaining ideas visit http://www.canopyrose.com/ or call the offices of Canopy Rose at 850-539-7750. 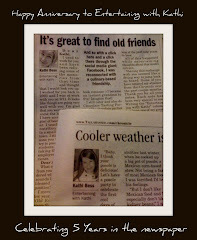 Since May 2006, Canopy Rose owner, Kathi Dameron has been writing a regular food and entertaining column (Entertaining with Kathi) in the Northeast Chronicle / Tallahassee Democrat newspaper. "Letting Politics Dictate What's For Dinner Tonight"
What sort of curious marriage of flavors are the vintage cuisine of the 30’s and 40’s with a Panamanian twist paired with endangered moose burgers and Baked Alaska meets Hawaiian luau fare and dreamy Delaware delights? They are the bold and imaginative essence of a menu inspired by current American politics. Throughout the history of the world, the creative arts have frequently depicted the current society in thought provoking ways. Why can’t culinary art do the same? So for today’s column, I spin the globe right back to our own nation and even to our own backyard with this Election 2008 Party Menu. “Don’t talk politics! Don’t talk religion!” Boy, oh boy if I had a dollar for every time I’ve heard that aphorism in my life, I could spend a week salmon fishing and moose hunting in Alaska or Island Hopping in Hawaii. Really now, who can resist the temptation not to engage in conversation about the very future of our nation? For my friends and I, politics and religion are always the BIG topics of conversation when we gather. It is during election years that I especially love to host parties in my home. The conversations are smart, thought-provoking and as a hostess I don’t get the least bit intimidated about how I’m going to entertain my guests since I know the conversation will speak for itself! Opportunities for election season parties include convention watching gatherings, debate-night dinners, political salons, discuss the issues suppers and, of course, the big election night result’s watching parties. With most of these events on weeknights, quick-fix expediency might be the perfect ticket. Why not set up a Cheesy Grits Bar or Mashed Potatoes Station with some unbelievable toppings? For a sophisticated crew, let the guests build their dish in a fancy stemmed martini glass. For a more country crew, perhaps some big, deep-dish soup bowls would be more appropriate. Start by cooking up a big, bubbling pot of stone ground grits, mashed potatoes, risotto, couscous, creamed corn, Hawaiian poi or autumn squash for your base. Then have a little fun selecting and preparing the toppings. Delaware Blue Crab, Skewered Southwestern Bites of Grilled Chicken and Grand Canyon Rattlesnake, Kalua Fire Roasted Pork, Last Frontier Grilled Wild Salmon, Crumbled Moose Burger, Chopped Macadamia Nuts…you get the idea. For Dessert, how about a Macadamia Nut Hot Fudge Sundae or a Vintage-Lovin’ Baked Alaska. You decide! Imagine a delicious dessert station laden with shortcakes, poundcake, angel food cake, fresh fruit, apple crisp with cinnamon streusel topping, rich chocolate dipping sauce, rich caramel dipping sauce, plenty of whipped cream, pots of fresh brewed coffee and a thick rich frozen cappuccino punch! If this sounds like the perfect ending to your soiree, then request the Canopy Rose Shortcake Station! This station is perfect for wedding receptions, holiday parties, legislative functions, Springtime Tallahassee parties, company events and other special celebrations. The Canopy Rose Latkes "Bar" is a popular action food station for North Florida and South Georgia Bar Mitzvahs and Bat Mitzvahs. 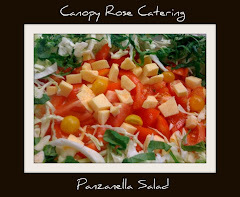 For more food ideas visit http://www.canopyrose.com/ or call the offices of Canopy Rose at 850-539-7750 for a custom-designed menu. There is nothing like a splash of fresh Florida citrus on your salads, vegetables and local catch-of-the-day. For the health and diet-conscious, Tallahassee area caterer Canopy Rose, offers fragrant, delicious and innovative fruity splashes that are popping in flavor. While many say that the Canopy Rose Sweet and Jazzy Dressing is the best salad dressing they have ever put in their mouth, it is a splurge - A DELICIOUS SPLURGE that everyone seems to love and request over and over again. But it is possible to request a different salad dressing to accompany your salad selection from the amazing list of salads of the Canopy Rose catering menu! As far as salad selections in the capital region, Canopy Rose Culinary Arts Studio and Catering Company has the most extensive list of salad options plus an almost unlimited list of custom-designed seasonal salad masterpieces. Need catering? Call Canopy Rose today at 850-539-7750. You'll be glad you did! The culinary expertise and passion pops with every detail and every bite of a Canopy Rose catered event. 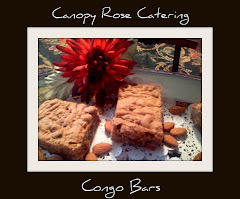 You can have your cake and eat it too when you hire Canopy Rose to cater your function. Simply alert us when you contact us that you are in need of lo-carb, vegetarian, kosher or diabetic food selections and we will take extra precautions to design a menu and prepare food that meets your specific dietary restrictions. Looking for food of a particular ethnicity? Just ASK! We love to create interesting international dishes as much as we love to create the regional tried-and-true fare of North Florida, The Gulf Coast and South Georgia. 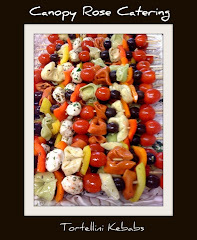 Canopy Rose is an amazingly versatile catering operation with culinary expertise second to none! Veal Oscar, that exquisite entree (literally) fit for a King has been added to the exciting new catering menu of Tallahassee area caterer, Canopy Rose Culinary Arts Studio and Catering Company. Actually Veal Oscar was created and named for a King over 100 years ago! Want to know more ... pull out your history books and read up on Sweden's King Oscar II. If Veal Oscar was good enough for a King, it will surely be good enough for a President-In-The Making, A Governor, A Senator, A Legislator or A Lobbyist in Florida's beautiful capitol city. Pan sauteed veal is topped with blanched asparagus and king crab then drizzled with fresh Tarragon-Champagne Bearnaise Sauce. Delicious! Just don't eat it everyday or you'll need to buy bigger pants! Among the most extravagant dinner entrees is the exceptional and luxurious tasting Chateaubriand. This center cut of the beef tenderloin has earned a reputation as being among the finest and the priciest of all meats. Canopy Rose Culinary Arts Studio and Catering Company is pleased to offer our delicious Chateaubriand to discriminating palates. Chateaubriand is the perfect star of holiday dinner parties, indulgent wedding receptions, gala black tie events and memorable once in a lifetime occasions. For more delicious and extravagant party fare we invite you to visit our website at www dot canopy rose dot com where we offer a delicious balance of affordable cuisine to over-the-top culinary masterpieces. Here is a delicious lunch / dinner menu that just stirred across my imagination while dreaming about the cooler autumn days to come. This menu would be perfect for home entertaining. 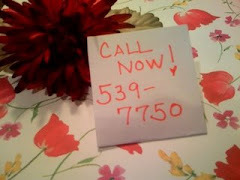 Did you know that we are North Florida's and South Georgia's best kept secret strategy for hostessing fabulous parties? Your secret will be safe with us! We will never tell a soul that you didn't cook the food yourself! If you desire we will even prepare the food in your dishes. Simply drop off your dishes at Canopy Rose Culinary Arts Studio and Catering Company in historic downtown Havana, Florida several days before your party. Of course, you would need to be on our calendar first! So give us a call at 850-539-7750 as early as possible to reserve your party. For more fabulous food ideas visit our website. What is a party in Tallahassee without the quintessential Iced Gulf Coast Shrimp? Our fresh shrimp comes from nearby Apalachicola Bay. Other options are available on request. 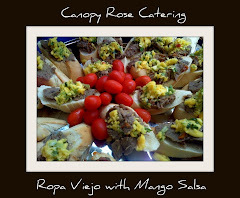 Please see http://www.canopyrose.com/ for more great ideas for your catered party. Mardis Gras, Cajun and New Orleans menu suggestions from Canopy Rose. Please see the Canopy Rose menu for additional food ideas. Questions? We can be reached at 850-539-7750. Corporate Event Planners will love the ease, flexibility and mix and match nature of the new Canopy Rose Catering menu at canopy rose dot com. This event coordinator's resource puts menus, themes, prices and catering packages right at the event planner's fingertips 24/7. The simplicity is great because the event planner no longer has to wait for a caterer to dream up a few customized menus or fax, e-mail or mail a hard copy catering menu to them. Usually when someone calls about catering, they want to see catering menus right at the moment that they call. They typically don't want to wait several hours, several days and certainly not several weeks to look at menus and guage prices. Canopy Rose has provided delicious food service solutions that will accommodate a range of different budgets. For large events with lean budgets, Canopy Rose offers customizable packages that begin as low as $10.00 per person. For events where perhaps only partial catering is required, catering clients will find an extraordinary line up of beautifully presented and delicious tasting ala carte selections, food station options, and even classes that teach How To Self-Cater Your Own Event. For events where hosts want to truly indulge their guests, the variety of creative, exquisite- tasting food possibilities is second to none! Canopy Rose thrives on artistic, seasonal interpretations. All of our food is hand crafted the old-fashioned way in our own licensed and insured catering kitchen. We only use the freshest and highest quality ingredients and because we create everything ourselves- we can tweak our recipes to modify any ingredient. If a client is allergic to something- we will simply eliminate that ingredient from the food we are creating for that event. Please keep in mind that Canopy Rose is a highly versatile caterer and we can cook just about anything. So if you don't see it on the menu- please ASK! We love custom designing the perfect menu to fit the event, season, taste preferences of the host and guests in attendance and budgetary concerns. Smart catering clients will want to bookmark this website and come back often! Questions? Canopy Rose Culinary Arts Studio and Catering Company can be reached at 850-539-7750. Score a touchdown this season with the festive party foods from Canopy Rose! Whether you need just a few great party trays or a complete full-service catered event for 2000 guests--- Canopy Rose Catering can help you! 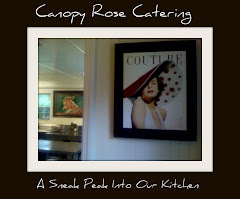 Visit www.canopyrose.com for menus, packages and prices. Baccarat, Monte Carlo, Casino Royale or Vegas - call them what you will, Casino Nights are a popular theme for Tallahassee area parties. Reminiscent of the popular James Bond movies of the 1960's, the mood is high energy, the attire is fashionable, and the food is fabulous. 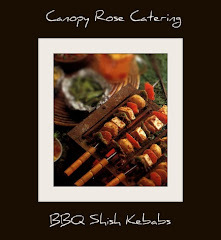 Get your casino party rolling with custom-designed full-service catering or party platters to-go from Canopy Rose! 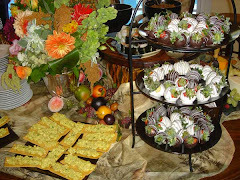 We offer exquisite appetizers, salads, side dishes, entrees and decadent desserts to compliment the theme of your party. Need bartenders, serving staff, onsite chef attended food stations, party rentals, venue rental, tables, chairs, specialty linens or event design services? We can help you coordinate everything through our team of party vendors! One of the first things that corporate party planners, office managers, brides and grooms and anyone who is entrusted with the responsibility of hiring a caterer needs to do- is to find out if the caterer that they are interested in hiring holds a current DBPR license and a certificate of insurance. In the state of Florida, the caterer's license should be with the Department of Business of Professional Regulation (DBPR). Caterers should carry a minimum 1 million dollar insurance policy. 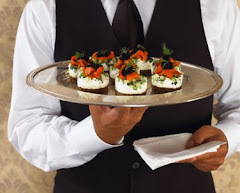 Protect your guests by choosing a reputable licensed and insured caterer for your upcoming event. Imagine a cocktail reception where guests are served beautiful, elegant bites of fancy dinner entrees. 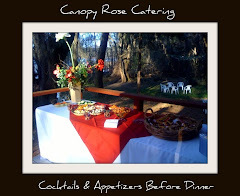 One of the options that Canopy Rose Culinary Arts Studio and Catering Company, the popular Tallahassee, Florida area caterer offers to its clients is the Canopy Rose Dinner-By-The-Bite Cocktail Reception Party. Instead of the standard frou-frou canapes, Canopy Rose will set up chef-manned action stations and / or butlered tray service of actual dinner bites. It's a fabulous concept that your guests will love! By using porcelain (or high-gloss black plastic) oversize Chinese soup spoons, scallop shells, shot glasses, edible shells and other small creative holders, Canopy Rose is able to provide bite-size portions of fabulous food that usually is reserved for plated or buffet dinner parties. Most anything that is on the Canopy Rose menus can be tweaked and served in bite-size portions! Naturally the price per person is significantly reduced if the guest will not be consuming a full dinner size portion of the food item. Of course, Canopy Rose also offers, traditional, frou-frou and contemporary appetizers, hors d'oeurves and first courses. Shopping for a North Florida banquet facility for your company meeting, holiday party, lunch and learn, wedding reception, rehearsal dinner or other special event? Questions? We can be reached at 850-539-7750. Here are several of our local venues that can be rented. North Florida Fairgrounds - 900 x 5 buildings Why not stage a spectacular special event? Southwood House and Cottage - 85-180 on first floor and porch for a stand-up reception. 250 outside for a tented affair on the grounds. Steinhatchee Landing Resort - 100 A bit of a jaunt! These are perfect for Tallahassee wedding receptions...and represent the type of appetizers that are offered in the reception packages that can be found along the right side of the www.canopyrose.com website. Celebrate the holidays in style this year with a Canopy Rose Holiday Feast. Choose from a list of Holiday Packages or let's custom create an event just for you and your guests. We can be reached at 850-539-7750. 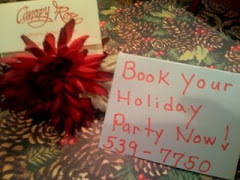 With the 2008 holidays just around the corner, holiday party planners are busy reviewing different party options. Will this year's office party be held at in the office, a restaurant, a popular Tallahassee area venue or the home of a colleague? What types of food will be served this year? What sort of setting will the party take place in? As a college student, care packages are tangible reminders of love and a great way for the recipient to make LOTS of new friends. There is such a buzz in the air when the package of edible goodies arrives. This year, let Canopy Rose cook up your care packages for you! How about sending a monthly package to your son or daughter? 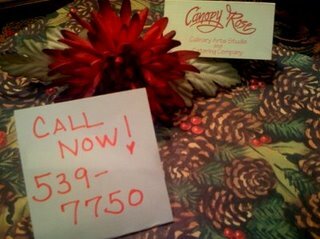 For more information about Canopy Rose Care Packages visit www.canopyrose.com or ring us up at 850-539-7750. We will be happy to create the perfect care package(s) for your loved one! Don't forget to ask about a CARE Package Program! Save these September dates for classes at Canopy Rose Culinary Arts Studio and Catering Company. For more information about cooking classes, special events, ordering specialty foods, and catering contact Canopy Rose at 850-539-7750. Question: I was reading your catering menu and noticed the term capers. What are capers? "The flower bud of a bush native to the Mediterranean and parts of Asia. The small buds are picked, sun-dried and then pickled in a vinegar brine. Capers range in size from the petite nonpareil variety from Southern France to those from Italy. The pungent flavor of capers lends piquancy to many sauces and condiments, they're also used as a garnish for meat and vegetable dishes." In my catering, capers show up in several dishes. In my home kitchen, I also keep a rather large jar of capers in the refrigerator. I love to add capers to fish entrees, exquisite sauces and everyday white albacore tuna paninis. Find capers on your grocery store shelves in teeny-weeny bottles or buy them a chunky-sized jar at the new Tallahassee Costco. Why not treat your guests to a fun North Florida Oyster Roast this fall-winter? This party is perfect for college football tailgate parties, engagement parties, Thanksgiving get togethers, Christmas parties, New Years Eve or New Years Day Soirees and Super Bowl Festivities. Begin with mugs of our delicious homemade Appalachicola Oyster Chowder, roasted oysters and some passed hors d'oeuvres. For the entree...more oysters, some Gulf Coast seafood, perhaps a surf and turf entree, roasted red skin potatoes, corn-on-the cob, cheddar cheese corn bread and decadent desserts. Yum!! Add a bombfire or outdoor fireplace or fire pit and you've got the makings for a great party- Tallahassee style. Availability: Call as early as possible to book your event. This caterer gets very busy! I'm starting to plan my Tallahassee wedding reception and I am looking for a caterer that knows how to make chocolate covered strawberries. Who should I call? Canopy Rose makes great chocolate-dipped strawberries. Not only are they beautiful to behold, they taste simply divine! Visit the Canopy Rose website at www.canopyrose.com for an amazing collection of ideas for your wedding festivities. 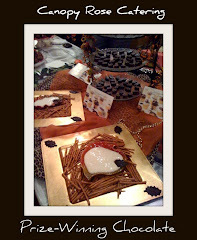 Canopy Rose also makes some wonderfull whimsical chocolate covered strawberry displays. One of our favorites is Kathi's White Chocolate Dipped Strawberry, Red Rose and Truffle Tree Forest. For a Christmas wedding this is the perfect tablescape for a decadent dessert buffet. In the springtime, Kathi makes beautiful topiaries with white chocolate-dipped fruits, fresh herbs and flowing ribbons that complement the wedding colors. Looking for a fun theme for your next party? 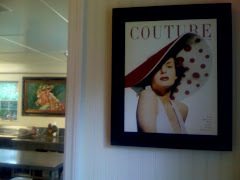 Why not let Kathi Dameron and the Canopy Rose Team help you stage a 1940's Style Supper Club? 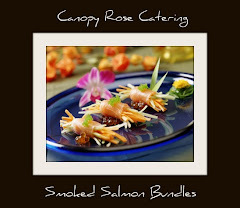 Caterer: Canopy Rose Culinary Arts Studio and Catering Company - very, very creative company! Great ideas, beautiful presentations, delicious food! Location: Tallahassee - Havana Florida (Serving the counties of Leon, Gadsden, Jefferson, Madison, Wakulla, Franklin, Gulf, Liberty, Calhoun, Jackn, Washington, Bay, Walton and in south Georgia Thomas County, Decatur County, Grady County, Seminole County, Miller County, Mitchell County, Colquitt County, Brooks County. Answer: Amuse Bouche are wonderful little bites that preceed a catered meal. They are often served on interesting little plates, in demitasse cups or on the popular oversized Chinese-style soup spoons. Question: Where can I order Amuse-Bouche in the Tallahassee area? Answer: Contact Canopy Rose at 850-539-775o or at canopyrose@aol.com. Canopy Rose will custom design the perfect Amuse Bouche for your wedding reception, holiday party or black tie gala. Question: Does Canopy Rose have a website? Answer: Yes! 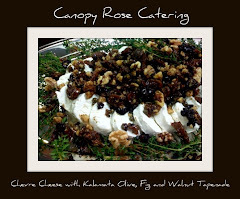 Canopy Rose has a great website with extensive menus and prices at http://www.canopyrose.com/ In addition to the many listed items that you will see on the menu, Chef/Owner Kathi Dameron is a culinary artist with a passion for whipping up delicious seasonally-inspired culinary masterpieces.